Noble gas compounds are chemical compounds that have an element from Group 18 of the periodic table in them. Group 18 (previously called Group 0) contains all the noble gases. For a long time, scientists thought that noble gases could not form compounds because their valence electron shell had no space for more electrons. This means that they could not accept any more electrons, which made bonding impossible. However, in 1933, Linus Pauling said that heavy noble gases could react with fluorine or oxygen, as they are the most electronegative atoms. His prediction was correct, and xenon hexafluoride (XeF6) was later discovered. Many more noble gas compounds have been found since then. 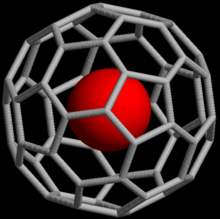 Noble gases can also make endohedral fullerene compounds when the noble gas atom is pushed inside a fullerene molecule. In 1993, it was discovered that when C60 is put under pressure of about 3 bar of Helium or Neon, He@C60 and Ne@C60 are made. Only about one out of every 650,000 C60 were found with a helium atom. But with more pressures (about 3000 bar), it is possible to get as much as 0.1%. Endohedral molecules with argon, krypton and xenon have also been made, as well as other compounds of He@C60. ↑ M. Saunders, H. A. Jiménez-Vázquez, R. J. Cross, and R. J. Poreda (1993). "Stable compounds of helium and neon. He@C60 and Ne@C60". Science 259: 1428–1430. doi:10.1126/science.259.5100.1428. PMID 17801275. ↑ Martin Saunders, Hugo A. Jimenez-Vazquez, R. James Cross, Stanley Mroczkowski, Michael L. Gross, Daryl E. Giblin, and Robert J. Poreda (1994). "Incorporation of helium, neon, argon, krypton, and xenon into fullerenes using high pressure". J. Am. Chem. Soc. 116 (5): 2193–2194. doi:10.1021/ja00084a089. This page was last changed on 9 November 2014, at 10:31.